Place will be visiting in Bishnoi Village Day Tour: Bishnoi village culture, Kakani pottery maker, Salawas durry udhyog. It is starting from Jodhpur where you will see the Indian village culture. The Duration of this tour is approx 8 to 9 hours and distance may be approx 110 to 120 KM. Bishnoi Village Day Tour Start from Jodhpur. the tour starts 9: am and come back at Jodhpur on 5: PM After Reach at Bishnoi Village we start our tour. Bishnois are one of the different group of people of Rajasthan who are popular for their rich cultural Rajasthani Life and their affection for animals and nature. 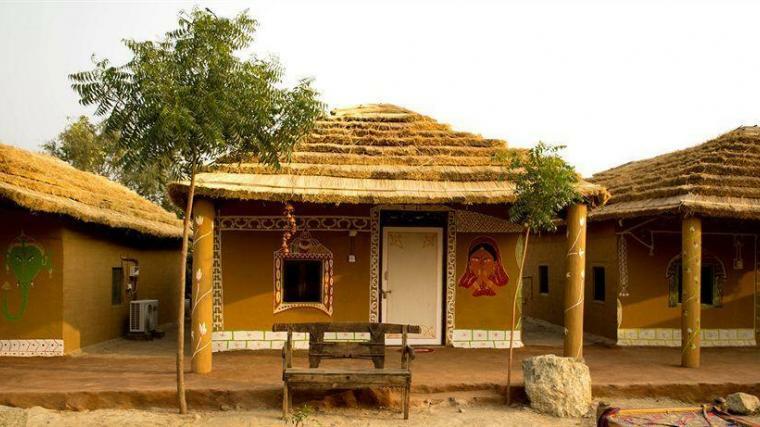 Bishnoi Village is an ideal place to experience Bishnoi culture and a village is famous for scenic landscape and wild animals like blue bulls, desert foxes, peacocks, black bucks, chinkara, partridges etc. Kakani village is known for its pottery and hand printing works. We visited one pottery showroom with a live pottery work. A potter showed us his skill in preparing three different items in one round of the wheel time – the flower pot, a vessel and a simple pot. There were varieties of pottery items available in the showroom at fixed prices. There was no pressure from the pottery makers to buy anything from them. To me, the prices appeared quite reasonable. We also visited a showroom of hand printed bed sheets and covers. These painters use blocks made of soft wood in various designs and use natural colours. Hence, the bed sheets and covers are costlier than what we get at the shops which are using chemical colours for printing. Again, here also there was no pressure from the makers to buy the bed sheets etc. Salawas Durry Udhyog established in 1897 by Lt. Fatohji, who remains as a source of inspiration to be dedicated to working. Presently the organization is handling and owning by the Mr. Usman Gani. Since the last one century Salawas Durry Udhyog has been manufacturing and supplying all kind of durries with good quality. Bishnoi Village Day Tour Finished at Salawas Durry Udhyog and Drive back to Jodhpur and Drop at Hotel and Airport. Looking for Taxi Service in Jodhpur to Bishnoi village then Jodhpur Taxi is best and comfortable taxi rides to our passengers.